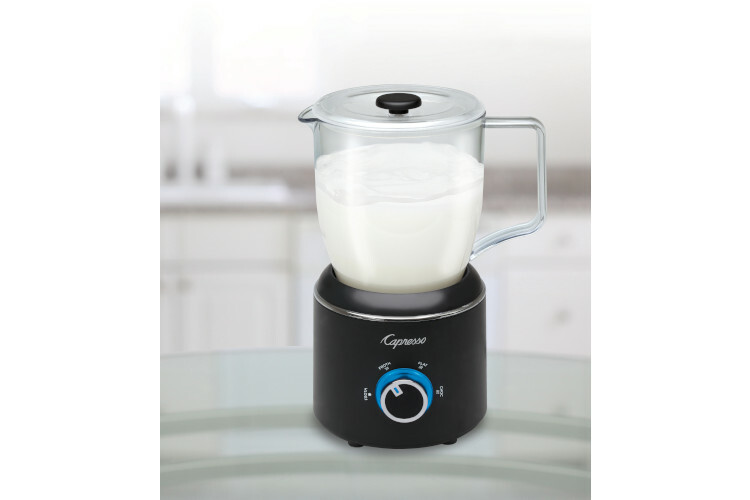 Capresso has created the ultimate machine for preparing yummy frothed milk for cappuccinos and lattes. Not only does it prepare cold and hot froth, it includes a hot chocolate function that lets you add chocolate chips or chunk directly into the pitcher to make a rich, frothy hot cocoa. With a single button you have 4 operations: cold froth, hot froth, hot milk and hot chocolate. The pitcher holds 10 ounces when frothing and 14 ounces when heating only. Create custom recipes from flavored hot chocolate and steamers, to hot apple cider to iced fruit lattes.